After a day of walking around the Princeton campus, digesting some fat sandwiches, and going to watch Premium Rush in theaters, Daniel and I decided that perhaps a lighter dinner was in order after the lunch we had. Daniel suggested going for some Asian food, so we decided to head over to Asian Bistro. 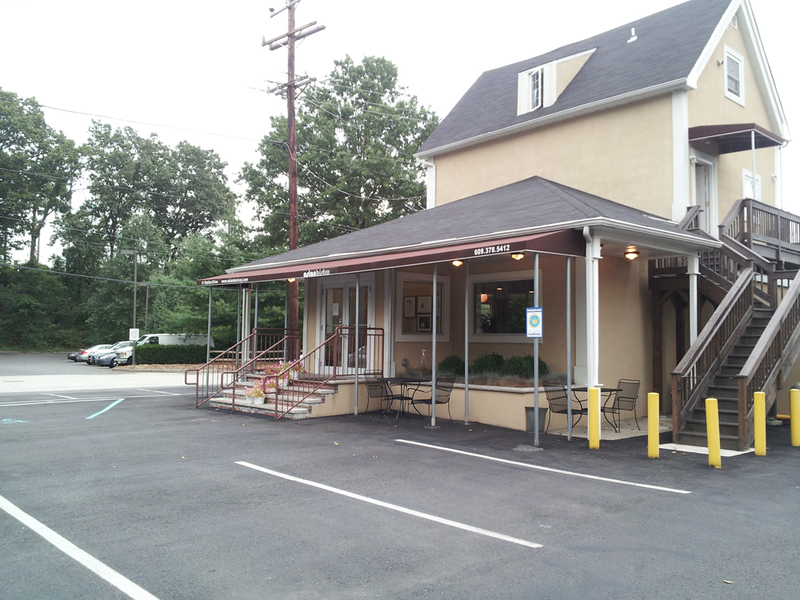 The restaurant is situated right down the street from the Princeton Junction train station, and is kind of at the end of the road coming off the nearest highway. However, Daniel told me that this place gets pretty packed once prime dinnertime hit, so we did our best to get there early. I got their Sunset Roll (spicy tuna inside with salmon and tuna on the outside) and their Lion King Roll (crabmeat and cucumber inside with salmon, flying fish roe, and green onions on the outside). Daniel went for their Spider Roll (soft shell crab, avocado, and masago) and a bowl of ramen. 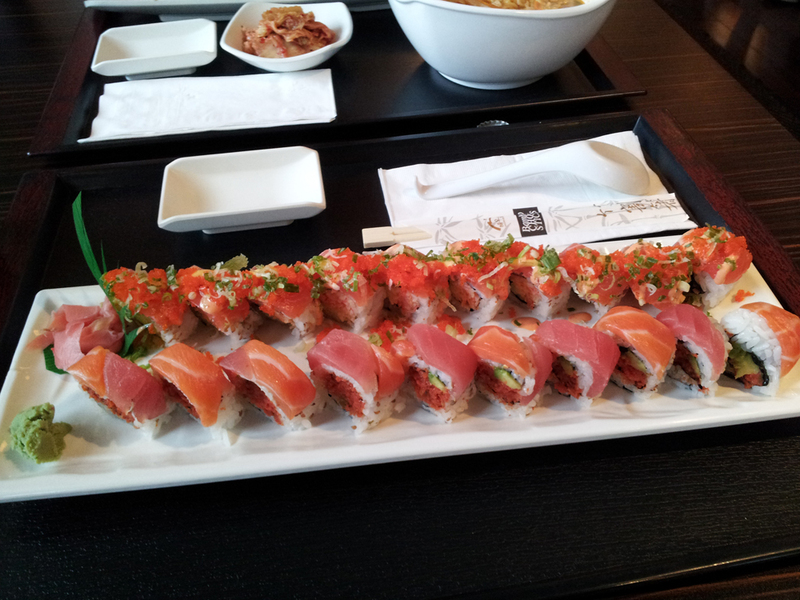 When my plate came out, I was immediately struck by the presentation of the sushi (take a look at the picture above). 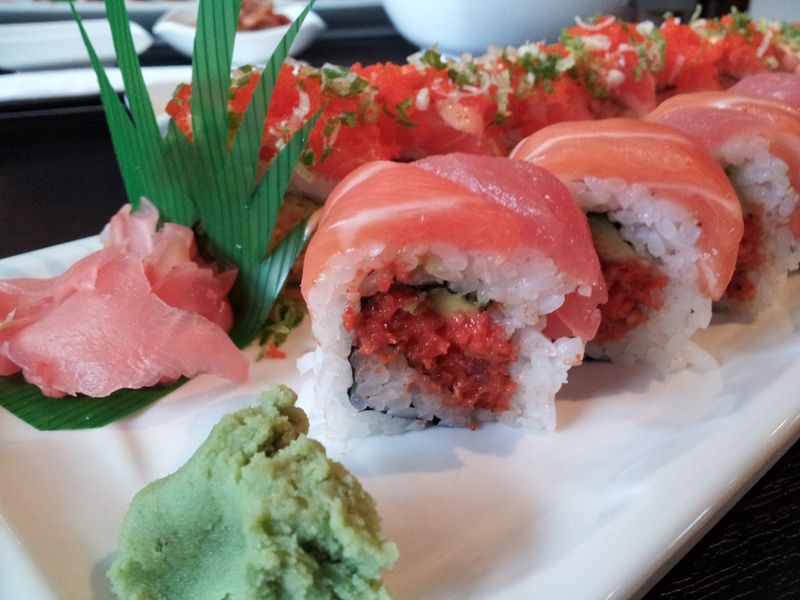 With the maki rolls diagonally lined up on a rectangular plate, it was a really impressive sight. Better yet, there were ten pieces there instead of the eight pieces I am normally accustomed to. Overall, I thought that the taste of the sushi was really good. 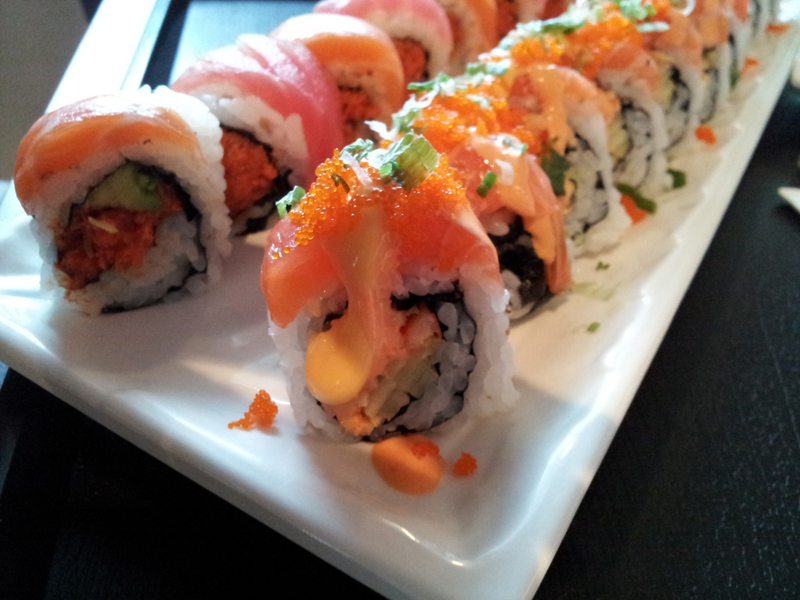 Innovative combinations of flavor with their ingredients, and it was very reasonably priced at $10 per roll. The sushi rice was a tad on the dry side for my taste, but the quality of the overall package more than made up for that. I’m curious to try out some dishes from their other Asian cuisines to see how they stack up; Daniel said that in the previous times he has gone there, the food has always been pretty good. I like the overall design of the restaurant interior as well. It certainly had a very contemporary feel to it, and the dinnerware appropriately matched that design element. I would love the chance to go back and try more of their food again in the future. I was impressed by the variety that they offered and at the quality of their food. Only tried the Japanese so far, but would like to try the others. The interior styling of the restaurant was done very well, with everything fitting that contemporary “bistro” feeling. The food came out really quickly, and the person who took our order at the counter was very friendly. I was very satisfied with the pricing on the maki rolls. They were really delicious and the value is unbeatable with 10 pieces in a roll. The pricing on the other dishes at the restaurant also look very reasonable too. Just did a sushi review too!